Why are we born? What is the universe? What is time? What is the reason behind everything? How should we live? What is the truth? What matters the most? Did God really intend to keep all this a secret? Or all the truths were always before us and we never came out of ourselves just to look around? These and many more questions have intrigued us all our lives. The education of a child in ancient times had knowledge pertaining to these questions as an integral part. But as we moved towards modern times, we lost many things which matter the most. We have lost the way of our lives with no one to show us the light. All our education and knowledge revolve around making a living. But though it may be potent to tell us how to make a living, it fails to impart us the knowledge of how to live. Moreover, we seldom find any time to read any books concerning matters outside our vocational realm. 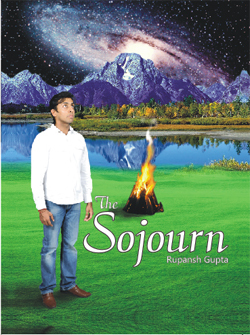 ‘The Sojourn’ is an attempt to fill the gap. In the most succinct yet captivating way, the book opens doors to many truths. It is a journey of not only our lives but the entire universe. By reading the book and totally immersing in it, the reader will find himself in a new dimension. His way of seeing everything will change. The truth, if manipulated, becomes a lie. The more efforts are made to hide it, the more it loses its identity. Therefore, what was always lying before us will be known to us forever. The truth is simple and elegant. That’s why it is the truth. By knowing its true nature and essence, we will see everything in its true grandeur. On including ‘The Sojourn’ in the curriculums, the students will come to know how to conduct their lives in the most effective way. They will find a guiding light in any situation of their lives. On repeated readings, the book will become a part of their subconscious mind and consequently, their second nature. This will give them a meaning and purpose for their lives. Those who have passed their study phase can read the book and implement the principles in their lives. The book will change their perception and will help them find their purpose. They will find the ways to resolve anything, since they will know the reason and true nature of all the existence. Thus, ‘The Sojourn’ is a book that will transform. When read with an open mind, and several times, new thoughts and truths will emerge each time, to ponder over. No matter whatsoever the situation a person may be in; on reading the book with a quiet mind and reflecting upon it, he will find solutions and ways out. With the limited time in our lives, these thirty five pages of poems will become a facilitator in real sense of the word. Therefore, the book is meant for everyone and will make the foundations of all civilizations very strong.